Buying meaningful Christmas gifts for children, ones that will help them learn while having fun, is always a challenge. Over the years, we have had mixed results giving our children and grandchildren things like: telescopes, binoculars, crystal growing kits, ant farms and magnifying glasses to encourage them to get outdoors and interact with nature. Last Christmas, we hit upon an idea for the grandkids that seemed to work well. It started when I saw some backpacks that the manager of Camas National Wildlife Refuge had assembled for schoolkids visiting the refuge. Each pack contained binoculars, field guides, notebooks and a few other items. The proverbial light bulb flashed on and I thought that with a little modification, this would be the perfect gift for most of our grandkids. Our most significant modification was to change the backpack to a vest. I use a vest for my own naturalist wanderings and find it quite useful to keep a myriad of small items reasonably organized and safe. So, we searched the internet and finally decided on vests made by backyardsafari.com. These seemed a little large for the four year olds though. We discovered that most National Park visitor centers carried child-sized vests, sometimes called Junior Ranger vests, and ordered several small ones through Grand Canyon National Park. Backyard Safari also carries a set of plastic tools—spade, tweezers, brush, mirror, probe and whistle—that allows the kids to pick up, poke about, clean and inspect items they find interesting. The tools are kept safely together on a carabineer that clips to the vest. This is a handy little unit and is especially useful for the younger kids. This Christmas shopping was getting fun. I soon found another website—acornnaturalists.com—and began filling the vests with other essentials. I ordered clear plastic containers in several sizes, specimen boxes with magnifiers in the lid and some Pocket Naturalist field guides for birds and insects. Optics were the biggest challenge. I preferred monoculars rather than binoculars, reasoning that they would be easier for kids to handle. I just couldn’t find what I wanted for what I was willing to pay. So, for the older kids, I ended up with inexpensive, but real, binoculars. For the younger kids we decided on easier to use fixed focus, “toy” binoculars. A notebook, pencil, flashlight, aquarium net and a small ruler came next. Then I moved on to what I considered the heart of any vest: magnifying glasses and hand loupes. We found inexpensive magnifying glasses in the eyewear section at WalMart. I discovered that amazon.com was a real clearinghouse for all types of hand loupes and had many reasonably priced ones. I’ll acknowledge that this gift benefited from someone demonstrating it with the kids. But once they understood what it was about, they seemed to enjoy getting out and “playing naturalist.” And after all, that was the idea in the first place. Arming kids with the tools to explore outdoors is an important step in keeping them connected to nature. 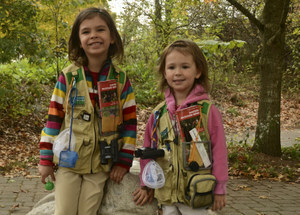 Naturalist vests loaded with fun and entertaining gear give them a reason to be outside. Get over 100 select columns in the Best of Nature. Get one for yourself and as Christmas gifts for friends and family.